penned by artist/author Mark Zahn. This may take a few minutes to open, your patience is appreciated! The unthinkable has happened in Rocky Beach. Titus and Mathilda Jones have announced they're going on vacation to visit Titus' long-lost brother in Oregon! Jupiter, Pete, and Bob quickly see an opportunity for adventure and agree to come along for the ride. However, the Three Investigators soon realize they've got more adventure than they've bargained for. A strange sea artifact that appears then disappears, a 200 year old pirate's legend, and a bizarre cast of characters makes this the boy's strangest case yet! 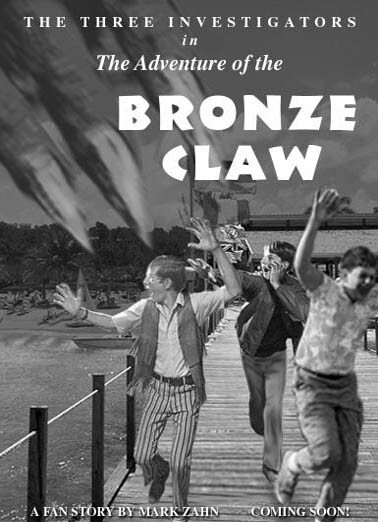 E-MAIL THE AUTHOR OF "BRONZE CLAW," MARK ZAHN! Story based on characters created by Robert Arthur. Characters depicted in the illustration are based on the Ed Vebell photos from the Philip Fulmer collection.